The Jackson family thought that whelping a litter of puppies in their home would be a fun thing to do. Turns out, they were right. The Jacksons are whelping their first litter of puppies, the D litter. Dexter, Dory, Dudley, Duke, Delilah, Diesel, Dewey, and Diego just turned six weeks old, and they’ve been living with the Jacksons since they were three days old. The mom, GEB Boise from Guiding Eyes for the Blind, gave birth to the eight puppies on June 25 at the SSD kennel. “Who doesn’t want a litter of puppies in your house?” said Jane Jackson. Besides seeing these adorable puppies sleeping and hearing their little puppy noises when they dream, her favorite things about whelping a litter is having puppy huggers visit her home and sharing information about Susquehanna Service Dogs with them. She also loves watching the puppies make progress. For example, one puppy wasn’t comfortable being alone, but then one day did fine by himself. Another puppy walked along the teeter-totter and managed to stay on all four paws. Caring for a litter of puppies isn’t all puppy snuggles and playtime, though. There’s a good bit of work involved. We keep track of a lot of information about the pups, including their weight, and that means lots of note-taking. And of course, they’re puppies, so there’s always something to clean, whether it’s the whelping box, a puppy, or the puppies’ toys. The toys and objects are rotated through the whelping box so the pups gain exposure to a variety of new objects, and every time a toy is removed, it needs to be cleaned. Each day, the puppies need to be exposed to something new, such as crate time, visiting other rooms, new toys and objects, and different smells, surfaces, and sounds. The Jacksons have a white board with a to-do list for the pups, as well as a chalkboard to keep track of which puppies have already been taken care of. It’s different than raising one puppy, says Jane. There are eight puppies to expose to clicker training. The Jacksons and the Wengers, another first-time whelping family who’s caring for the “C” litter, have been paired with two of our experienced whelpers. Susan Tyson and Diane Bohenick, both of whom have whelped numerous litters for us, are just a phone call or text away, and they have lots of tips for the first-time whelpers. For example, Susan suggested using baby food as a treat for the puppies. That way, you can just dip your finger into the jar and let the pups lick it off. Jane has been using chicken and rice or beef vegetable baby food for the “D” puppies. Diane and Susan also suggested having an outdoor space for the puppies. Taking care of eight puppies is time-consuming, and our other volunteers offered some tips that have been real time-savers. For example, at least half of the whelping area is covered in newspaper, and this section serves as a pottying area for the pups. We’re always collecting newspapers for the puppies. However, one of our volunteers, Betsy Smith, rolls the newspaper rather than folding it, which makes it very easy to grab one or two sheets. The Jacksons also bought a large piece of vinyl to protect their hardwood floor in the puppies’ area. A lot of people may be hesitant to whelp a litter because they’re worried the puppies will mess up their house. But the puppies don’t really mess up the house, said Jane. Thank you to the Jacksons and the Wengers for taking care of the “C” and “D” puppies for the first eight weeks of their lives! This week is International Assistance Dog Week, a week devoted to celebrating assistance dogs and the many ways they change people’s lives. We started celebrating a little early this year because last Friday, three people passed the public access test with their new service dogs. SSD Ottawa and SSD Slate are now working service dogs, and SSD Boomerang is a facility dog in a school. And in June, four more dogs were placed—SSD Beaker, SSD Brooklyn, SSD Falstaff, SSD Hamlet, and SSD Seifert. These dogs and their partners spent two weeks in Team Training learning how to work together. They started by practicing the most basic skills, such as attention, sit, down, and stay, and moved on to the specialized skills and behaviors each dog learned specifically for their partner. Congratulations to all of our new service dog teams! We’re looking forward to hearing stories about your new service dogs. We mentioned that our new teams passed their public access test, which means we have certified that their service dog meets certain standards. The dog will be able to go anywhere in public with their partner—restaurants, movie theaters, amusement parks, post offices, grocery stores, etc. Even though the dogs are allowed by law to accompany their partners in public, not everyone knows and understands the law. Service dog teams are often denied access because people don’t understand that service dogs are not pets. The Americans with Disabilities Act (ADA) lays out the law for service dogs. These ADA requirements are available online. 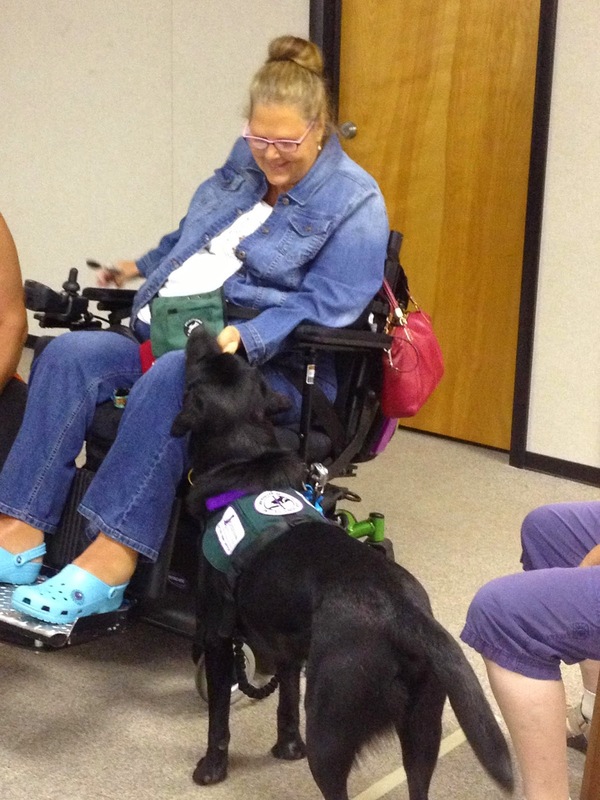 Service dogs perform tasks or do work for people with disabilities. Service dogs are not pets. Any business, nonprofit, or state and local government that serves the public must allow service dogs to accompany people with disabilities everywhere the public is normally allowed to go. This means, for example, that a person with a service dog cannot be seated in the back of a restaurant far away from the other patrons. Service dogs must be under the control of their handler. Other people can only ask two questions about a service dog: (1) is the dog a service dog required because of a disability, and (2) what work or task has the dog been trained to perform. If you see a service dog in public, please remember not to pet it. Don’t pet, feed, talk to, or otherwise interact with a service dog. The dog is working. Of course, you can certainly talk to the person, and if they give you permission to pet their dog, you can. However, if the person says no, please respect their choice. Susquehanna Service Dogs raises, trains, and places service dogs to assist individuals with disabilities. We train service, hearing, balance and companion dogs to support men, women, and children to be more independent. What a Summer! We Whelped a Litter of Pups for SSD!